Has anyone self-installed a set of EV14's and got the car to a decent state of tune? Is there a Master List of Table Names in the standard B5 S4 M-box? I plan to use these injectors as well so I'm also curious. Are you using 550s or 750s? Stock 4 bar FPR and 85mm hitachi MAF? Hey - Spot on. I want to run Tony's base file m-box with a 85mm MAF. On top of that I want to run the stock FPR, a Bosch 044 pump, and Bosch EV14 550cc injectors. This combination seems like the best overall setup to me, given what I understand about the quality of the parts. Does anybody have the Bosch part numbers that people are using for this application? The 118 variant has 22deg dual cone and the spray pattern is canted (like stock), but it is only 347cc at 3 bar. I got my car (2001 A6 2.7T) running fine with them. 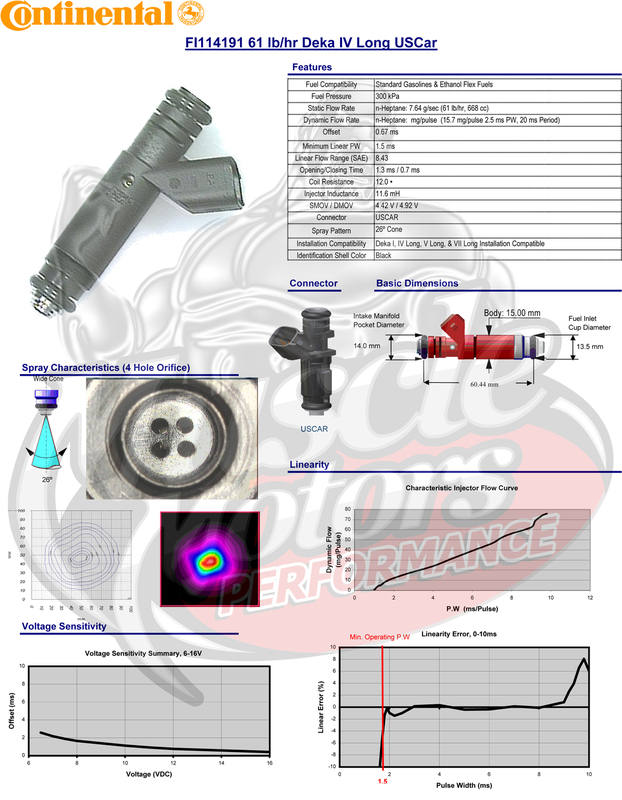 I am using a 90mm MAF housing, 52# EV14 injectors (0 280 158 117/118)@4bar, PJK04s, 2.8L heads. It wasn't any harder than 630 Seimens at 3bar. I just had to tweak the file slightly, they ran a bit leaner at WOT than the Seimens did. What all did you tweak to get them to run well? Just KRKTE or something else? I refined my KRKTE so that lambda requested jives with wideband actual (it was slightly lean compared to the Seimens). I also set KFKHFM to 1 across the board, logged about 100 miles of driving under varied conditions, and then used that data to refine KFKHFM (this usually takes a few repetitions). I am not certain that I needed to do the KFKHFM step, but it has become habit when I am experimenting. I like to have LTFTs around -3 or so, since when I am logging the fuel I use is of known quality. 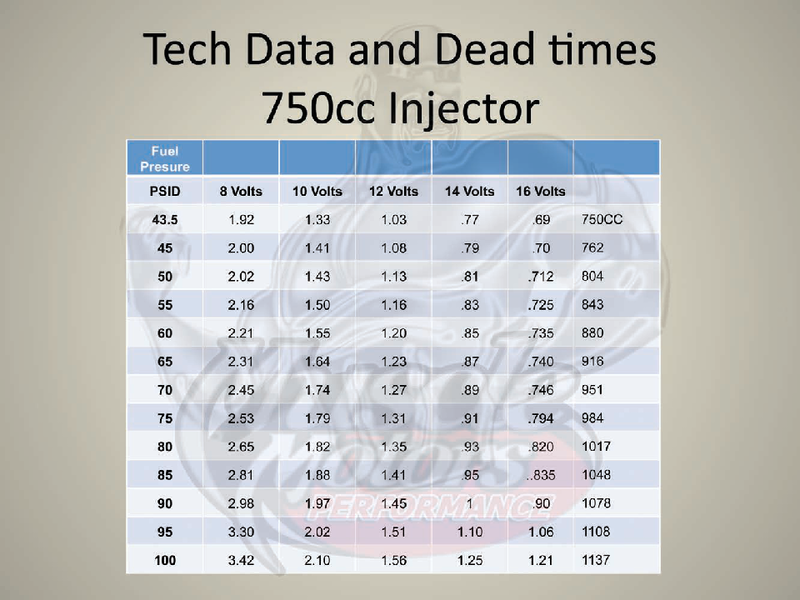 Paul from Injector Dynamics has given me the following data. The volumetric flow rate on gasoline at 125F is 628cc/min. Units are volts and microseconds. I tested these values with excellent results thus far. What KRKTE value is everyone using with the Bosch EV14 550s? 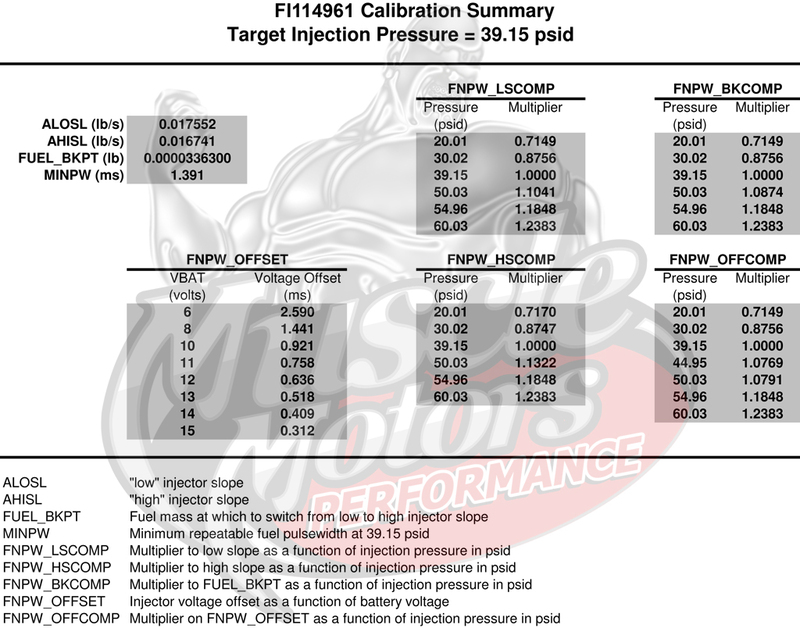 What's important on this spreadsheet is FNPW_OFFCOMP table which tells you how much you need to multiply each dead time at its voltage to get real value for the FPR you're running. Vast majority of people need to use 60.03 (for 4bar FPR) value and multiply the original FNPW_OFFSET (pretty close to values you listed) byt the multiplier. 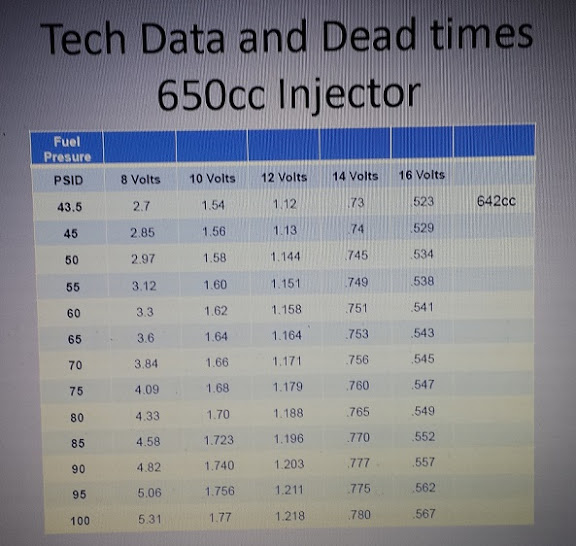 I tried tuning with the base values but was getting really strange O2 corrections for idle/part throttle with things getting more in-line as the injector on time was getting longer indicating that the injector lag was smaller and smaller in respect to on-time. I am running 1000cc ev14 injectors so any timing discrepancy like that gets exaggerated on my set up. I plugged modified (for 3bar FPR I have) values and now I am dead on with corrections. What value would you use for 4 bar FPR or 60.03 multiplier? So the EV14 injectors are a lot "slower" than Dekas? Latency/lag at 14v should be 0.8ms * 1.25 = 1ms for 4bar FPR according to info posted in this thread?